Mario is back! This time… well, he has to save the princess again. Can he do it… again? You have to be really, really patient with this one. It's not bad, and certainly I've seen much worse Mario clones, but it has some infuriating aspects that detract from the overall gameplay. The most frustrating one is certainly the controls. Hit detection is EXTREMELY finicky - not to say random or inconsistent. I'm not the type to attribute my deaths to "bugs" - if I die, it's because I'm sucking at the game or have made a bad/stupid/reckless mistake. Here, however, it is common for me to lose a couple lives just trying to KILL A GOOMBA. That's right, the easiest thing in SMB is made difficult by the fact that if you touch it from anywhere but the EXACT PRECISE angle, you die. The same can be said for some jumps, that require you to hit the EXACT balance between speed and height, or to hit the EXACT ceiling pipe, in order not to fall. So something as easy as stomping an enemy or jumping over a pit is made into a lethal deathtrap. Plus, there are NO POWER-UPS, apart from the occasional extra life, which means that...yup, one hit and you're dead. Overall, it's frustrating, but if you're really patient, you may get to have some fun with it. The remaining departments are better. Graphically, it looks just like every other decent Mario clone. 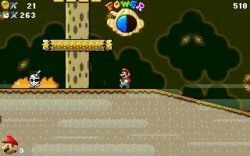 When you stomp an enemy, they "squash" rather than puff, which is visually horrible, but apparently used to save memory (some Flash Mario games also use this technique). Levels look like they should, the camera distance is correct and the enemies and pipes look good. The Mario sprite used is from the SNES, and overall this is a decent department. However, the sound is where the game truly shines. All the familiar melodies are there, but given a funky updating treatment,which makes them sound modern and fresh as well as nostalgic and recognisable. All in all, I appreciate what this guy is trying to do, paying homage to Mario. But you just can't overlook the glaring shortcomings the game presents. 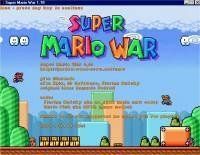 As a one-man-show, and a small download, it's all right; but a real Mario fan should demand more. Yes, the princess has been captured once again and Mario must set out through the lands to rescue her from the evil King Koopa. 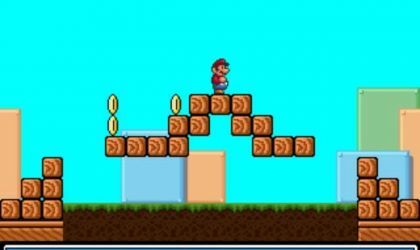 Being a Mario game, the graphics invariably look like Mario graphics. They are nice and crisp in this version and no real derivation from the source material has occurred. That’s pretty nice. 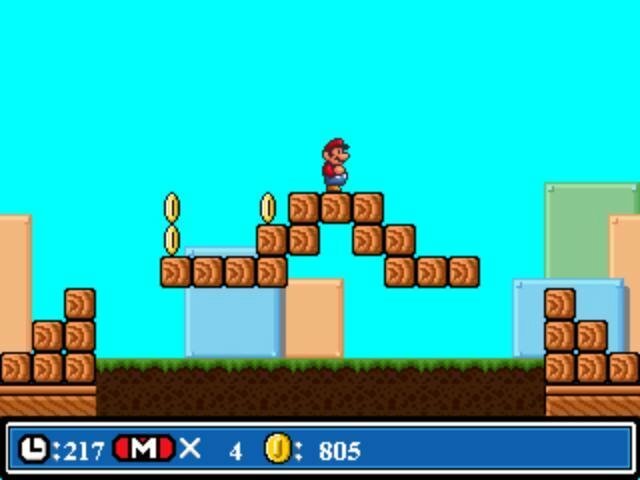 Mario is controllable in this game, unlike some others, though for some reason he’s a little slow. Perhaps after all these years he’s putting on a little weight? Mario’s speed is the only real concern here and the only thing which is of any great annoyance. The sounds and music are pretty authentic but sometimes get quite annoying, because they have slightly different emphasis on different instruments, though on the whole it’s nothing too bad and it’s easy to live with. So as far as Mario games go, this one is alright if you can put up with his slight reduction in speed. 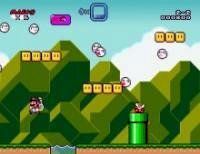 Super Mario Bros. 4 is the newest in the Super Mario Bros. series and all the charm of Mario graphics are not lost. Once again our favourite porky plumber sets out on an adventure through the Mushroom Kingdom. I suppose it's not bad for an unofficial Mario game, but for crying out loud, why do I DIE when I jump on a koopa shell already in motion!? What if I want to stop it or change its direction? Also, for some reason his legs are petrified and he can't duck. I understand that he has lost his power ups and needs to find them, but it feels more like his normal physical abilities have been drained from his body. The graphics on my Windows XP were really bad. The game would be better and more fun if the graphics were better.